After our nice two week break to do some Valentine's Day themed activities, we are back to our Color Themes! This past week we did brown. At first, I wasn't too excited about the color, but it ended up being a great week. We started with a bin of brown objects. It included the brown animals from his Little People Learning Zoo, some brown play food, a set of horses from the dollar store, and some wooden balls and spools I painted brown. His bin also had some brown ramps from a marble run I found at a garage sale last summer. I didn't include the marbles because he still puts everything in his mouth. However, we discovered that the painted wooden balls still kind of fit in the track, even though they don't fit through any of the holes. Almost every day he had me set up the ramps to put the balls down. I also showed him how to put the wooden balls down a toilet paper tube. He enjoyed it so much, that he tried putting all of the other objects from the bin down it as well. He quickly figured out what did and did not fit. This week we ended up doing a ton of coloring. I think it has finally clicked for him. Here he is coloring a Pete the Cat page from Making Learning Fun. I also left the pages from our English and Spanish brown color books together to let him color. You can click the picture below to download the color books. By far the best brown activity was playing with chocolate cookie dough (I washed the eggs). It made a huge mess, but was totally worth it. Of course we also did our regular color theme activities. We read our color related books, played with our Leap Frog maracas, and played with the crayon color puzzle. One of the cute color books I picked up from the library was The Deep Blue Sea. It is similar to that kids song about the hole in the ground. We also found the book I Am a Rainbow by Dolly Parton. 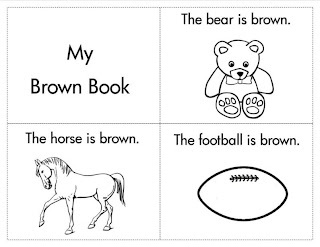 And, of course, we read Brown Bear Brown Bear. I was so happy with our Tot Trays this week! They all go pretty much constant use. The one that surprised me the most was the puzzle. I have had a puzzle for him every week since we started doing trays. Usually he only really does one if I get it out and start doing it myself. This week, however, he kept bringing me the puzzle. He wanted to sit in my lap and have me help him put the pieces in, sometimes three or four times in a row. The puzzle wasn't even new or particularly special. This is what the stinker was doing with the big box of puzzles while I was setting up his trays. The tray that probably got the most use was the bread from his Melissa and Doug Cutting Food. I was worried the first day I showed him the tray, because he really didn't get it. He was so frustrated at not being able to do it himself. He quickly caught on and was constantly having me put the bread back together for him to cut again. The third tray was just an old beat up cookie sheet and a bunch of magnets. To go with the brown theme, I put the magnets in an old cocoa container. What he really liked was to put them all on the cookie sheet and have me point to each one and way what color it was. In fact, he got mad at me any time I stopped naming the colors. It wasn't actually on a tray this week, but I did get out our nesting blocks. This week was the best I have ever seen him stack. Here are our favorite finds from week eight of our book challenge! Xander loves this whole series, so I try to pick one up from the library every few weeks. He loves to touch the textures and wants to read them again and again. A cute book with lots of sounds and rhyming. Xander thought it was amusing.